It was with mild astonishment that we came across this handsome structure from the early 1890s. 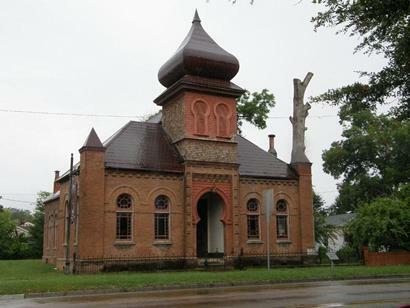 It stands today at 706 Church Street in Port Gibson, Mississippi. Church Street is also the fabled Highway 61, central flyway for Delta musicians goin’ to Chicago (sorry that I can’t take you). The day we found this building we knew we’d find something that we weren’t looking for because we weren’t looking for anything. It never fails. You head out the door with absolutely no expectations and before you know it; there it is (or there they are). Judging by the abundance of signs around Port Gibson saying “Save Church Street” it appears there may be plans afoot of widening the most attractive street in Port Gibson. 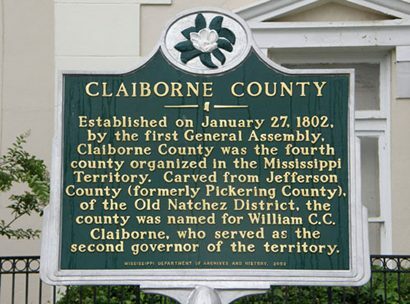 Port Gibson is the county seat of Claiborne County, Mississippi and Church Street is the most visible street to people passing through town. Many of Port Gibson’s ante-bellum homes line both the sides of Church Street. While church street in its present form is guaranteed to leave travelers with a lasting memory of a charming Mississippi town, if “progress” has it’s way; it will become just another highway town – indistinguishable from its brethren in Texas, Pennsylvania or Indiana. New curbing, new fast food franchises and new camera-equipped stop lights. Identified by a handsome wooden sign as the Temple Gemiluth Chassed (Gift of the Righteous), the building has a historical marker which adds little more information than what you’ve already learned from this article. 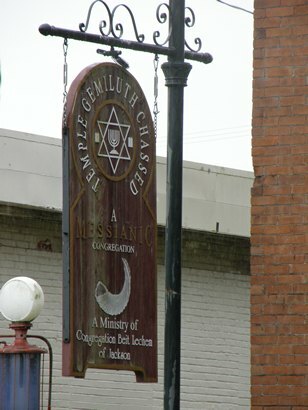 The sign merely adds that the structure is unique in Mississippi – but that’s immediately apparent. 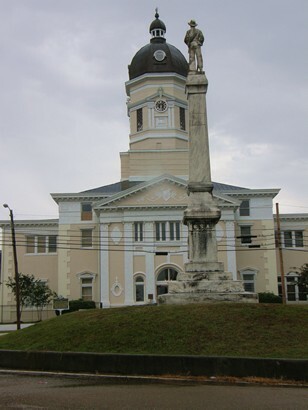 Port Gibson also has a handsome but unusually placed courthouse – complete with a stone sentinel perched on a high column. 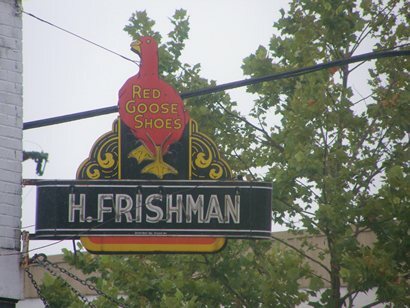 A bit lower on the totem of small town icons is a rare personalized neon sign advertising Red Goose Shoes. Stores selling Red Goose “Juvenile” shoes were strictly for the carriage trade. It was early brand-identity and no self-respecting family of means would dream of sending their offspring off to school with run of the mill footwear. Fort Worth’s Sundance Square has made their Red Goose sign a regional icon – just as Dallas has done with their much-larger, red neon Pegasus. Red Geese have long been on the list of endangered neon so it was a thrill to discover one in such an unlikely place. If you’re visiting Mississippi, we hope your route takes you to Port Gibson, halfway between Natchez and Vicksburg. Our best wishes go to the people of Port Gibson for their success in preserving Church Street.